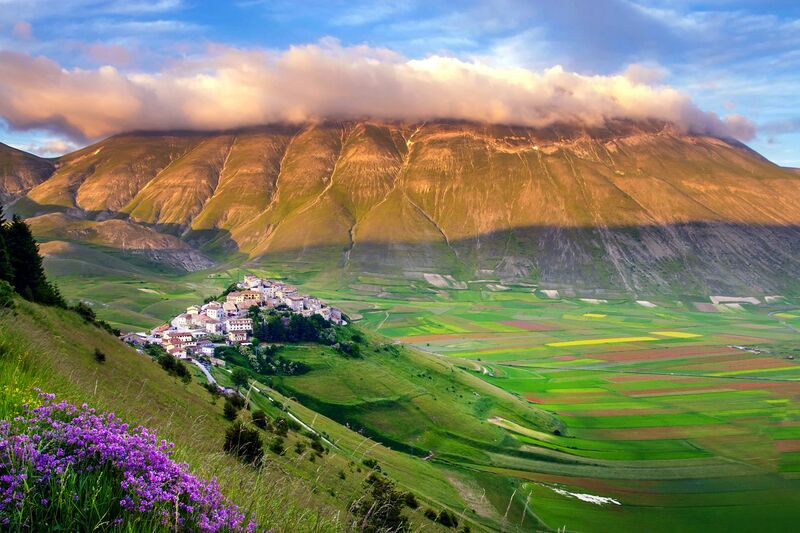 Located at the centre of the peninsula between the regions of Lazio, Marche, and Tuscany, Umbria is one of Italy's gems. Nestled between the gently sloping hills and meadows that blossom in the springtime are countless market towns, where you can find all sorts of treasures. Umbria's calm, relaxing landscapes are a great place to spend a restful holiday, and every year, Umbria's Basilica of Saint Francis in Assisi attracts thousands of pilgrims from all over the world. Boasting a whole host of recipes and delicious flavours, Norcia, in the province of Perugia, is famous for its exquisite truffles and 'norcinerie'. This term comes from the city's name and refers to a particular type of meat made exclusively in this region. Norcia ham has been awarded PGI (Protected Geographical Status) recognition. The gently sloping hills of Umbria are covered in olive trees, the age-old source of a precious ingredient - Umbrian olive oil. You won't find an Italian dinner table without it, and it's used to make bruschetta, which consists of toasted bread rubbed with garlic and drizzled with olive oil.